Read Book Don't Let the Pigeon Stay Up Late! PreSchool-Grade 2-The star of Don't Let the Pigeon Drive the Bus! (Hyperion, 2003) returns in another irresistible tale. Hurrying away to brush his teeth, the pajama-clad bus driver implores readers not to let his feathered friend stay up late. Youngsters are thrust into the role of caregiver as the puerile pigeon attempts to talk his way out of the inevitable, coming up w PreSchool-Grade 2-The star of Don't Let the Pigeon Drive the Bus! (Hyperion, 2003) returns in another irresistible tale. Hurrying away to brush his teeth, the pajama-clad bus driver implores readers not to let his feathered friend stay up late. Youngsters are thrust into the role of caregiver as the puerile pigeon attempts to talk his way out of the inevitable, coming up with requests that range from manipulative (I hear there's a good show about birds on TV tonight. Should be very educational) to cajoling (Y'know, we never get to talk anymore. Tell me about your day-¦) to classic (Can I have a glass of water?). Meanwhile, the fowl fights yawns and tries to keep his wide eye open, despite a drooping lid. Defying drowsiness to the last, he finally falls asleep, clutching his stuffed bunny tightly under his wing. Set against comfortably faded pastel backgrounds, the cartoon artwork focuses tightly on the main character, with his comments presented in dialogue balloons. The black-crayon lines speak volumes, as the pigeon's body language and the positioning of his ever-expressive eye humorously convey each nuance of the text. 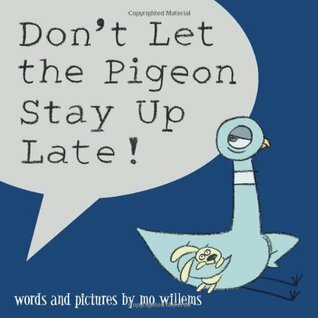 Children will be charmed by this bedtime treat, which will have them laughing out loud at the pigeon-and at themselves.-Joy Fleishhacker, School Library Journal Copyright © Reed Business Information, a division of Reed Elsevier Inc. All rights reserved.